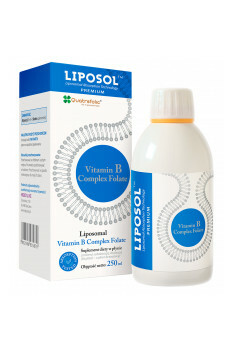 Aliness Liposol™ Vitamin B Complex Folate is a unique formula containing all vitamins of the B complex in liposomal forms. The preparation is characterised by very high assimilability and biological availability, and thanks to its liquid form, it is also very comfortable in use. The preparation is recommended for the purpose of preventing B vitamin deficiency. It contains bioactive forms of folic acid and vitamin B12, which is why it can be used by people whose methylation processes are not sufficient due to MTHFR gene polymorphism or metabolic disorders. It will also prove helpful for mums-to-be, both pregnant and planning a child. A unique liposomal technology is used in this supplement in order to ensure the optimal absorption of active substances. Molecules of each vitamin are encapsulated in phospholipids obtained from non-GMO soy. Thanks to that they easily penetrate biological membranes and are able to reach the locations in the organism that are usually hardly available for water-soluble compounds. That way supplementation efficiency is enhanced and the time needed to experience first effects reduced. Apart from using a formula guaranteeing excellent assimilability, the producer also made sure that the compounds are available in forms that do not require conversion in the organism and can be directly used to meet the needs of the organism. Thanks to that the product is versatile and suitable for people with methylation disorders and MTHFR gene polymorphism. The supplement does not contain synthetic folic acid – instead, the patented biologically active form Quatrefolic® takes its place. Vitamin B12 is present in the form of hydroxocobalamin, that is the target form of vitamin B12 that does not require transformations in the organism. The supplement has the form of a tasty pineapple-flavoured liquid. It is very comfortable in use and should prove perfect for people who have trouble swallowing capsules. The preparation is sugar-free – its tasty sweet flavour comes from a natural and healthy sweetener, xylitol. The box contains a measuring scoop that helps to administer the right amount of the preparation. Vitamin B1 (thiamine) – determines the right functioning of the nervous system, participates in the production of the neurotransmitter GABA, and supports the formation of neurolemmas around nerve cells. Moreover, it affects the breakdown of carbohydrates, proteins and fats delivered with food. It reduces the feeling of tiredness and fatigue. Vitamin B2 (riboflavin) – along with folates it regulates the process of homocysteine utilisation. It has analgesic properties and is sometimes used for migraine treatment. Moreover, it promotes normal blood pressure and enhances bone density. Vitamin B3 (niacin) – has a beneficial effect on the lipid profile, reduces cholesterol concentration, and promotes the health of the cardiovascular system. It is a NAD+ precursor, promotes longevity, and slows down aging processes in the organism. What is more, it has a positive effect on the condition of the skin and hair. Vitamin B4 (choline) – determines the process of neurolemma formation, as well as is involved in acetylcholine production. Good memory and other cognitive functions depend on its availability. Vitamin B5 (pantothenic acid) – essential for the production of the hormones synthesised by the adrenal cortex. As a coenzyme A precursor, it is responsible for the activity of a large number of enzymes. It helps to maintain the right condition of the skin and inhibits excessive hair loss. Vitamin B6 (pyridoxine) – supports the process of homocysteine metabolism, participates in the production of important neurotransmitters. It is responsible for the normal activity of the enzyme involved in histamine breakdown. Vitamin B7 (biotin) – beneficial for immune system function. It strengthens hair and improves the condition of the skin and mucous membranes. It is involved in the formation of neurolemmas, which protect neurons and are responsible for the transmission of nerve impulses. Vitamin B8 (inositol) – antidepressant and anxiolytic properties. It improves the mood and helps to enhance mental well-being. It can be used to alleviate sleep problems. Moreover, it successfully aids the treatment of PCOS (polycystic ovary syndrome) and metabolic disorders. Vitamin B9 (folic acid) – determines the right development of foetuses and reduces the risk of malformations, which is why it is crucial for pregnant women. Moreover, it participates in methylation processes and is responsible for homocysteine utilisation. It is also involved in neurotransmitter production. Vitamin B10 (PABA) – helps to form tetrahydrofolic acid, which is responsible for the normal process of methylation and homocysteine conversion to methionine. Additionally, it helps to assimilate vitamin B5. It combats the harmful effects of UV rays. Vitamin B12 (cobalamin) – determines the formation of red blood cells, thanks to which it prevents anaemia. Moreover, it regulates the processes of homocysteine transformations. It takes part in the production of neurotransmitters and promotes normal nervous system function. To sum up, Aliness Liposol™ Vitamin B Complex Folate is a perfect solution for people with B vitamin deficiencies. The forms used in the preparation allow fast and efficient deficiency supplementation. The preparation is particularly recommended for women who are or are planning to be pregnant. Supplementation should also be considered by those with elevated homocysteine levels. Take 5 ml daily during a meal. Prepare the recommended amount with the help of the measuring cup provided, eat directly or dissolve in 250 ml of water or juice. Shake before use. After opening, store in a refrigerator. The supplement provides 11 crucial vitamins of the B complex. Properly adjusted doses, biologically active forms, and the liposomal formula guarantee that even 1 serving (5 ml) a day will be efficient. Specialists advise that B vitamins should be taken in the first half of day, as taken in the evening they can make falling asleep harder. Vitamins of the B complex are water-soluble vitamins but because the preparation contains niacin, it should not be taken on an empty stomach. Food reduces the risk of the so-called niacin flush (strong redness of the skin, usually along with the sensation of burning and tingling). Flushing is not dangerous and passes rather soon but it usually causes considerable discomfort, and some people are additionally embarrassed by a red face. Water, phospholipids (non-genetically modified lecithin NON GMO), humectant (glycerol), preservative (potassium sorbate), ethanol (<2.8%), natural sweetener (xylitol - birch sugar), D-alpha tocopherol (vitamin E), aroma (pineapple). Hydroxocobalamin is one of four available forms of vitamin B12. Its advantage over cyanocobalamin consists in the ease of conversion to biologically active forms. It is sometimes used as an antidote in cyanide poisonings, because of high affinity to its ions. This form of vitamin B12 may be an interesting alternative for people, who for various reasons cannot use methyl group donors and want a better-quality supplement than the popular cyanocobalamin. Vitamin B12 is incredibly important for maintaining proper energy metabolism and high condition of the nervous system. Because of the influence on neurotransmitter synthesis, it contributes to the improvement of mood and psychological functions. It also takes part in DNA synthesis and creatine production by the possibility of increasing the concentration of SAMe. It also helps to maintain homocysteine level in lower values, as it supports its remethylation to methionine. It also plays an important role in blood-forming processes and regeneration of myelin sheaths in neurons. Hydroxocobalamin in mono-supplements and complex vitamin preparations may be found in the offer of muscle-zone.pl.